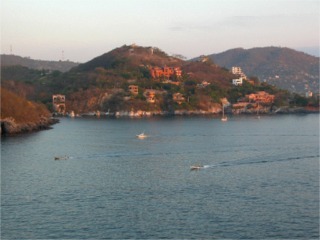 click photo to enlarge Zihuatanejo and Ixtapa are one stop. The two towns are only about 5 miles apart. 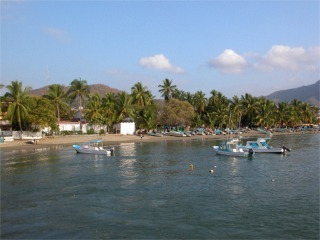 Zihuantanejo is the original little fishing town and Ixtapa, like Cancun, is a government planned tourist town. 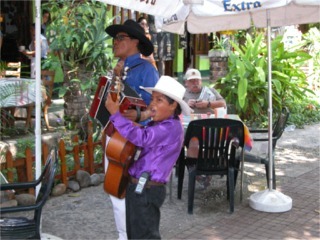 What we saw of Ixtapa was OK but we both enjoyed the old town of Zihuantanejo and would be willing to go back and spend a week there. This sunrise picture shows the little fishing boats going out for the day. click photo to enlarge In fact, every picture on this page is from Zihuatanejo. click photo to enlarge This is a picture of one of the shops that line that market street. 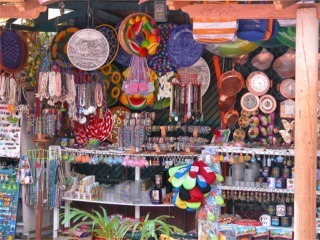 The wares the shops sell are all very colorful. The brick streets in this part of town are very narrow. Of course you had to bargain to get a good price because they always start out high. 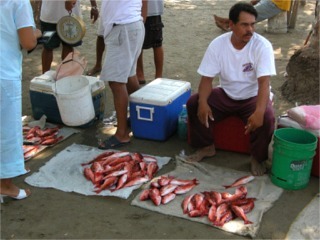 click photo to enlarge Along the beach under some tents the fishermen come to sell their days catch. In the upper left of the photo you will notice he is holding up a bucket on a scale. You pick out what you want and that is how they weigh it. click photo to enlarge Along the beach there are many restaurants. This one had this duo singing to try to lure you in. The kid was cute but he was a terrible singer.